Crafting Azeroth version 1.0 has been released! Crafting Azeroth v1.0 includes over twice the content of the original beta version, including the new continents of Outland, Northrend and the Great Sea, in addition to the original continents of Kalimdor and the Eastern Kingdoms. Additionally, many zones that first appeared in the beta version have been re-generated using newly added blocks and features. To learn more about v1.0, you can view screenshots in the updated image gallery, read the included readme file, or explore the interactive map in your browser. There is a nice Mac OS X installation guide here. Thanks Joshua Reeves! Someone asked me to modify CA-Static and CA-Teleport so they would only affect the Crafting Azeroth map, so I made a separate version of both plugins that checks the world name before applying any changes. You can download them here and here. Additional information about the map and many older screenshots are available in this this archived post. Q. How does the conversion process work? A. 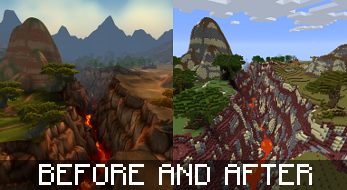 Custom software converts the continents of World of Warcraft into Minecraft blocks using a process known as voxelization. This software converts everything in the game, including all the buildings and natural details, down to the individual tree stump. Once the parameters for the software have been set, the conversion process takes approximately 48 hours and requires no human intervention. Prior to the conversion process, I needed to match textures from World of Warcraft to the appropriate material in Minecraft. For example, an object with a wooden texture might be converted into wooden planks, while an object with a mossy texture might be converted into mossy cobblestone. I created a special software tool to help perform this assignment, but selecting materials for all 10,000+ textures in the game still required many hours of work. Q. How large is the world? A. The current version of the map spans approximately 500 square kilometers and contains over 100 billion blocks. The highest part of the world, the peak of Mt. Hyjal, stands more than a kilometer above sea level. 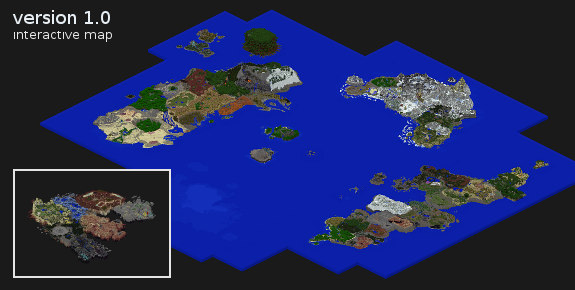 Since the map exceeds the Minecraft height limit, the world had to be divided into seven altitude layers, each connected via a server-side plugin that teleports players as they approach the height limit. To be played locally, the map requires 22 gigabytes of available hard-drive space. Q. Does the world include underground areas, like dungeons and caves? A. Yes, the map includes all caves and dungeons that are not part of a separate instance. So, areas like Blackrock Mountain are freely accessible, but dungeons like Blackrock Depths or Molten Core are not. The map also includes many randomly generated caves similar to those found in Minecraft. Q. Do you plan to convert any other zones, such as Pandaria? A. Yes, work has already started on Pandaria, but it will take a bit more time before the zone is ready to be released. The conversion process can also be used on dungeons and battlegrounds, so they may appear at a later date, but they are not top priority right now. Q. Where can I download a copy of the map? A. The full map is available to download right now, just click the BitTorrent link at the top of this post, or download from this mirror. If you don't want to download the map to your computer, you can explore a read-only version of the map by adding wow.cursecraft.com to your in-game server listing. (new) Q. I downloaded the map, but now I'm stuck in Outland. What do I do? A. Entering the Dark Portal in Hellfire Peninsula should return you to the Blasted Lands in Azeroth, just as it does in World of Warcraft. If the portal takes you to the Nether instead, you may not be using the correct plugins. Check the readme file for instructions on how to download and install a Bukkit server with the required plugins. The readme also lists some useful /tp commands for teleporting to key locations. (new) Q. The game runs really slow when I'm near a jungle. How can I fix this? A. There are two important things you can do. First, set your graphics in Minecraft to "fast", so that leaf blocks are opaque rather than transparent. Second, make sure that you are running the map on a Bukkit server with CA-Static-1.0 plugin correctly installed. Doing both of these things will greatly improve performance in large jungles and forests and should also help preserve the map from damage. (new) Q. Can your software convert games other than WoW? A. The same technique could be used on other games, but it would require a tremendous amount of additional work. The converter would need to be adapted to handle different file formats and then specially configured for the new data set. This is a very time-consuming and technically challenging process, so I have no plans to use the software to convert other games. Q. Who is involved in this project? A. The conversion software for this project was developed by Rumsey (RamsesA). Hosting support for the Minecraft server is provided by Cursecraft, and in particular Martin Benjamins (Marlamin), who helps manage the server directly. The mapping software used to generate the Google Maps view of the project was developed by the Minecraft Overviewer team. For a more detailed list of credits, please consult the readme file. Special thanks also goes to Alan J. Lee for offering to redirect the craftingazeroth.com domain to this page. A. In addition to posting here, you can contact me via [email protected] or Twitter, or send a private message through this website. If I do not respond right away, check if it's something covered in the readme or this FAQ. One question though... where will you put outland? INSTA-EDIT: I just realised that the Nether would be perfect for it. You'll be a happier person if you're miserable all the time. xD, I just got off WoW and now I see this, now i'm going play it again. Good work :smile.gif:! Truly awe inspiring. I kind of wanna dust off my old WoW account now. Clicks for the dragon, please? The whole of Azeroth? I'll check back in 20 years when it's done. This is generated, not made by hand (as said by the OP). The application is really close to being finished in my opinion. I'd be surprised if it will take longer than a month to finish. And as I said on MMO-Champion, this is truly great work and we hope we'll end up hosting it on CurseCraft for everyone to collaboratively work on perfecting/detailing the still rough generated world. Server co-administrator of CurseCraft, the official Curse minecraft server. Updated main post with a map of Kalimdor. It's so big I had to write custom software to produce the map. What about dungeons? Does your script do those? In principle, yes, although lighting them would be a chore. The terrain is very nice but it looks like you're gonna need to do the buildings by hand. Most of them will need some sort of touchup after they've been generated. It's still a lot easier then building it all from scratch. That's true. Good luck to you. EDIT: It's also weird how much Kalimdor's changed since I played WoW. (I quit during WotLK) I can't wait to see how Azeroth looks. Simply amazing. I am in awe of your software creation prowess. I have been looking for a quality terrain generator and was hoping that we could collaborate in some fashion? Tthis is great, but you didnt REAALLY make it if its all generated. Thats just my opinion, you ciuldve done it by hand , wand and voxel sniper :/ but then again thats just how i wouldve done it great job at wrtig the generators ffor the map.